Do you dream of winning millions on the lottery? You're not alone and there are plenty of people looking for an angle that will help them win it. Is it really possible to play a system or some kind of strategy that will make it possible to win where others have tried and failed? For anyone looking for that elusive backdoor, that tantalizing possibility of snatching the top prize from under the noses of the millions who don't and never will, that miraculous cheat of all cheat, this article may hold the answers! But first, let's look at what we're up against here. The first thing you need to remember is that the lottery is by nature a game of chance and that there is absolutely no skill involved in any way, shape or form that will influence the outcome of the game. In fact the only way to beat the game is to rig it illegally so that you can predetermine which balls will be selected by the randomizing process. In reality, this is highly unlikely, despite attempts by certain TV shows to hint at the possibility of corrupt authorities doing just that. I believe it was an episode of "First Edition" from a dozen or so years ago that tried to create just such a scenario. In reality though, as long as the games are observed by real people as the live draw is made, it is very difficult to rig a lottery game. Not impossible (nothing is impossible, right? ), but just very difficult. Many people choose their numbers according to what are known as "hot" numbers and "cold" numbers that are published in some places. The theory is that if you only choose hot numbers on your ticket, there is a greater chance they will come up on the next draw. Others claim that by choosing cold numbers, there is a greater chance of them being drawn because they haven't shown up for a long time and are due for a showing. The reality here is that every single game must be treated like it is a completely clean sheet and every ball has an equal chance of being drawn as every other ball in every game. This seriously degrades any perceived odds difference of a certain number being drawn or not. The fact is that just like flipping a coin, the result of a subsequent flip is not in any way influenced by the results of any of the preceding flips. So in theory, just as "heads" can be flipped 30 or 40 times in a row, a number 10 ball can be drawn every week for several weeks. Similarly, it can be bypassed for the same number of draws with equal chances and there is no way preceding draws will influence a subsequent one. But that doesn't stop anyone from speculating on this aspect of the game. And it's one of the reasons why people play the lottery every week with high hopes and aspirations that are based on a falsehood that most are in total denial about. So now for the $64,000 question on everyone's mind. How do you be certain of picking the right six numbers that will be drawn on the next lottery draw? But? Does there even have to be a but? But even that is a misconception. Most lottery winners are either syndicates or already very rich people who like to gamble with massive outlays on the game. So while you're pathetic pound or dollar or euro or whatever that buys you a single line of six numbers has about as much chance of making bank as the Earth has of colliding with a major asteroid, some high roller is contemplating the much reduced odds of their several thousands of number combinations of turning up a winning combo! In fact, if you want to play a game where the odds are playable enough that you might actually have a chance of making a profit, you're going to have to have a massive bankroll and very deep pockets and be prepared to take a massive risk. In other words, if you want the odds to come close to making a win much more plausible, you must increase your bet to cover many more combinations of numbers so there is a better chance of getting a match. That means playing multiple lines and not just a few dozen. I'm talking many thousands of lines with multiple combinations of numbers, which is the only way to reduce the winning odds to anywhere close to making it real. I didn't say it would be easy or cheap! And that is how to be in with a real chance of winning the lottery. Not the answer you wanted to hear? I guess not, but it's the closest to the truth you're going to hear anywhere! Now get back to that dream and enjoy it, because we all have to have dreams! 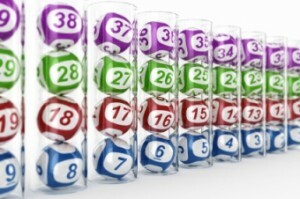 PS: There is always the option of joining a syndicate system like big fat lotto that pools lots of lines from participants to vastly increase the winning chances. The only downside is when it does win, you only get a percentage of the winnings pool. PPS: Imagine everything you could do with all that lovely cash when you win...!